Get Slick With The Ultimate Luxury Lube! 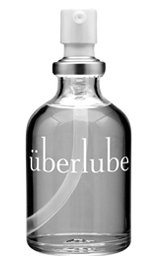 “Feel pure silicone bliss with the most luxurious lubricant available – Überlube! Made from a superior blend of ingredients including skin-soothing Vitamin E, this lube goes on just like natural moisture yet lasts long. Just a few drops from the no-drip toughened glass bottle makes any sensual encounter mind-blowingly slick.